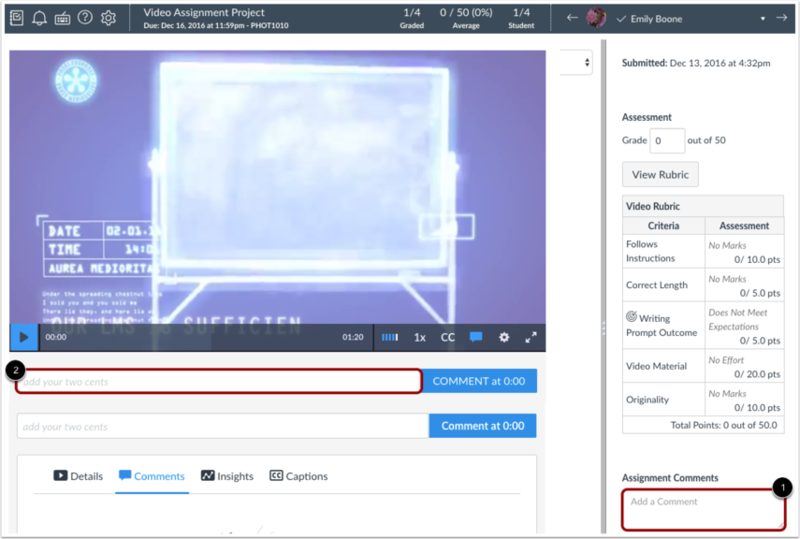 Once a student has submitted an Arc video or audio file as a submission, you can view the submission in SpeedGrader. The type of submission determines the view shown in SpeedGrader: Text Entry or File Uploads. Click the name of the assignment. Use the student list to locate a student submission. 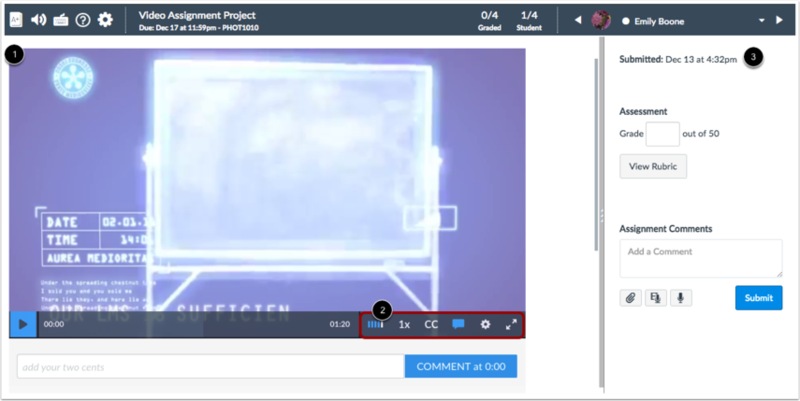 SpeedGrader displays the student submission in the viewing window . To view the video or audio file, you can use any of the controls , which includes managing the volume, speed, captions, and quality. You can also view the video in full-screen mode. If the student re-submitted the assignment, SpeedGrader displays the most recent submission. You can view previous submissions in the submissions menu . 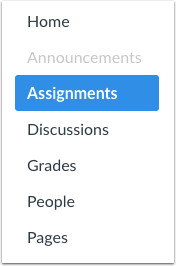 If you want to leave comments in the media, you can add assignment submission comments in the sidebar  as well as inline comments directly related to the media . 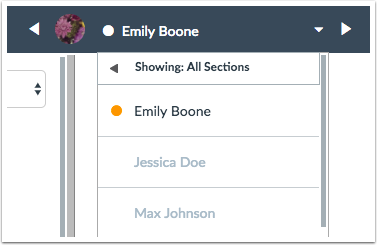 Assignment comments in the sidebar should be used for high-level comments that you want to display in student grading comments. Students can view comments in the Submissions Details page and in the Conversations Comments filter, in addition to any external notifications. Inline media comments can be used to comment on specific moments in the media. These comments are retained in the video and are not sent through notifications or posted elsewhere in Canvas. To grade the assignment, enter the grade in the Grade field . 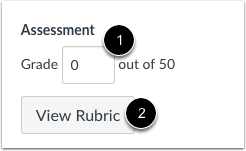 If you added a rubric to the assignment for grading, click the View Rubric button . For each criteria item, select the rating that fulfills the criteria . The number of points will update in the points field . If you want to add a comment for a criteria item, click the comment icon . 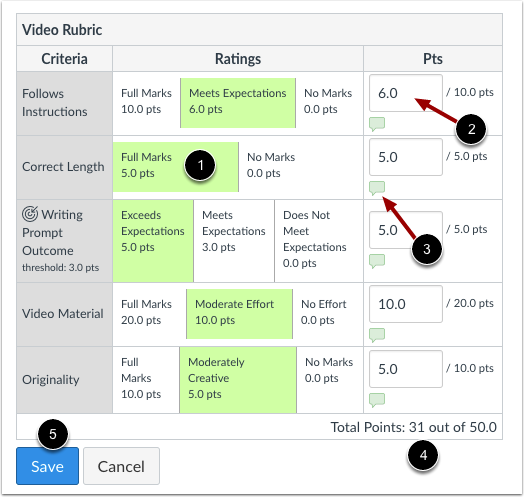 When you are finished, the rubric shows the total points at the bottom of the window . Click the Save button . View the grade for the assignment. Note: If you graded your assignment with a rubric but the Grade field does not update, your rubric was not set for grading and you will have to enter the score manually. Previous Topic:How do I submit Arc media as a File Upload assignment in Canvas as a student? Next Topic:How do I view Arc media using a test student in Canvas as an instructor? Table of Contents > Canvas and Arc > How do I grade Arc media submissions in SpeedGrader as an instructor?